Training for a marathon or any long runs also requires looking after your feet. I have been running for many years now, and have never struggled with blisters until about 3 weeks ago when I tried to break in my new trainers in time for the Paris Marathon. I wore these trainers for a few short 5 km runs without any problems, but this one longer 15km run just did not feel right. When I started feeling the famously uncomfortable sensation before a blister is formed, I was not happy. Why now? After all these years of running? Luckily I got lots of advice on dealing with/preventing blisters on Twitter and Instagram (good running socks, special plasters, talcum powder in socks). One of these is to make sure you moisturize your feet on a daily basis. I have completely stopped doing so in colder months, have let my feet down with not doing such an easy task. Well, we all learn by making mistakes. In just over a week, I will be running the Paris Marathon and am very pleased I have received the OOFOS recovery shoes for a review. I already have one pair, but could not resist their latest London limited Edition. 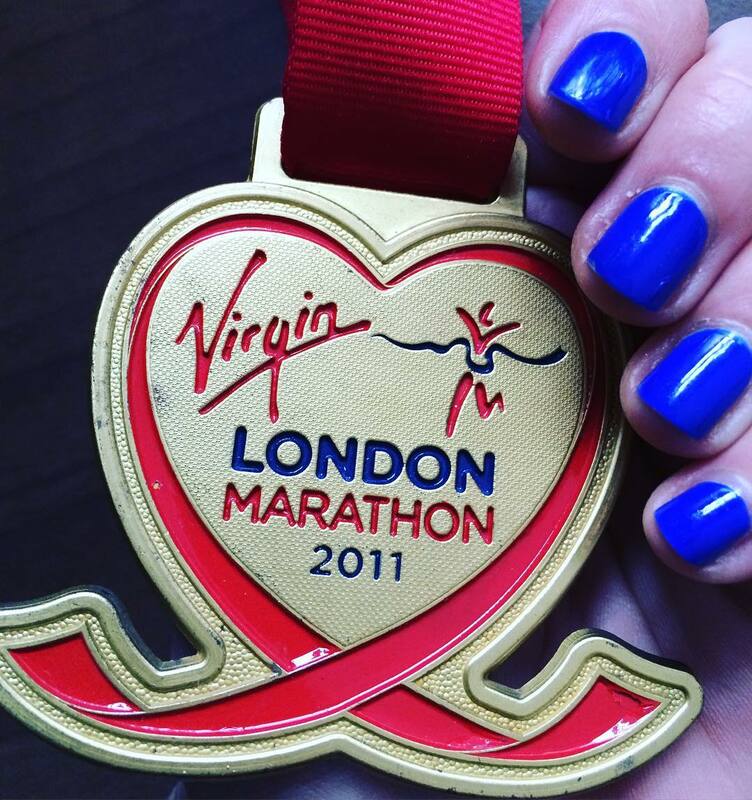 just a shame I did not get into the London Marathon this year, hopefully next. It was back in 2011 when I ran this famous marathon, and will never forget it. These lovely OOFOS will be packed with me to Paris, and cannot wait to wear them after running the marathon. 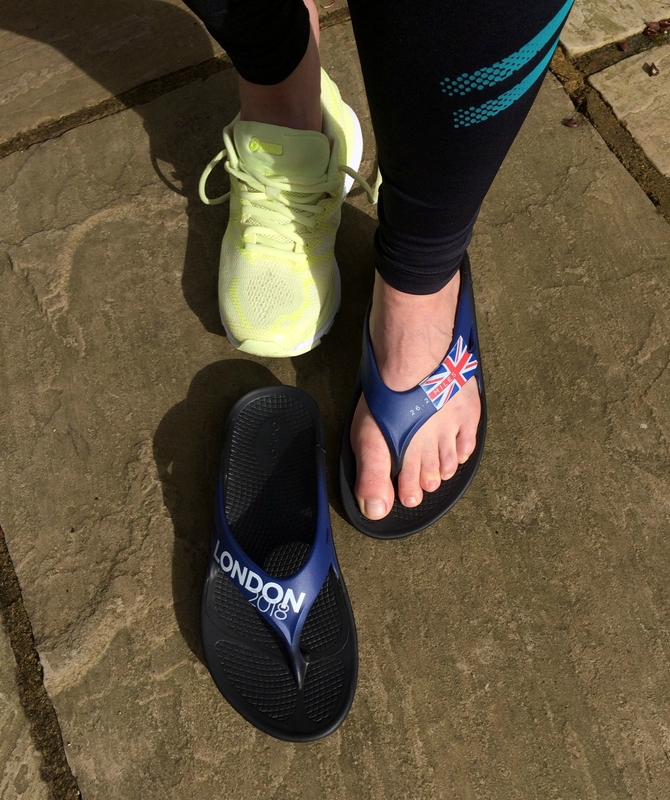 As runners start to up the mileage ahead of the upcoming London Marathon, UK Elite running coach and OOFOS® ambassador, Tom Craggs, reminds competitors that putting your feet up during a training week is equally important to slogging it out on those long grueling runs. Take the hard with the easy: Don’t fall into the trap of thinking you need to hit every run you go out on hard. That’s not the way endurance physiology works and will likely leave you really struggling to recover from the collective load of all the miles. Try this: Avoid running back to back hard days. Mixing hard days with an easy run or rest days is the best way to ensure you both train your body with a mix of intensities but also ensure you have adequate recovery to adapt to the harder sessions. Get to bed: Sleep your key recovery weapon. Whilst it’s great if you can get 8 hours sleep a night the truth is the quality of your sleep is just as important. We move through several cycles as we sleep and it’s when you are in your deep sleep that the crucial growth hormones are released. Try this: Leave smartphones and laptops away from the bedroom, try to avoid eating immediately before bed or drinking caffeine or alcohol late at night. A cool, dark environment and a consistent pattern of getting to bed at the same time most nights. Cut it back: Progressing training is a key element of getting fit for the marathon. That said if you just view your training as a block of 10-16 weeks where each week just gets harder than the one before it’s both mentally and physically exhausting. Try this: Aim to include a cut back week every 3-4 weeks in your training where you slightly reduce the overall volume and but back the long run in order to give your body that extra rest it needs to then adapt and progress. Kit yourself out: Products designed to speed up your recovery are now widely available and many can give you that little extra few % you need to feel great on your next run. Try this: Compression garments are beginning increasingly popular as a recovery aid with some research suggesting they can improve blood flow and speed recovery after hard training. 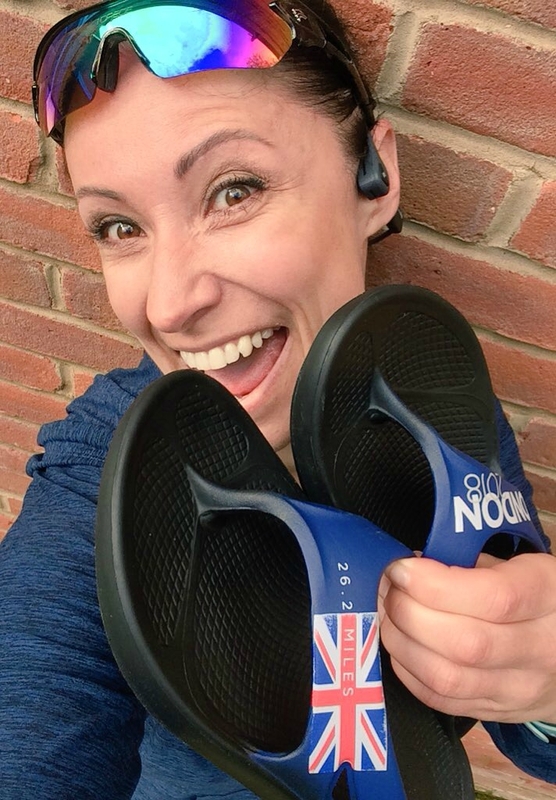 You put 2-3 times your bodyweight through your feet each time your foot hits the ground when you run, OOFOS footwear is a fantastic option – reducing impact when standing and walking allowing your feet to relax between sessions. Fuel and recover: Your nutrition is clearly a critical factor in your recovery between your running sessions. As your training progresses your focus on getting the right nutrients to refuel and recover should also progress. Try this: Aim to get some fuel back into your body within 15-30 minutes of finishing a session. A mix of 3-4 parts carbohydrate, 1 part protein is a great mix and most people prefer it in a liquid form – such as a milkshake. Refueling quickly after a session will speed up your recovery and is particularly important if you are training most days. The ‘little things’: For most athletes the key to recovering well is never down to one single factor, the best at recovery get the ‘little things’ right frequently. Try this: Get into a good routine and habit of daily stretching and complete a simple core routine 2-3 times a week. Snack well between meals and ensure you have a warm dry set of clothes to change into quickly if training in cold wet conditions. Be flexible: Runners can have a tendency to being a slave to a training plan. The truth is ‘life’ throws things at most of us that factor heavily on our ability to recover. Sometimes you just need to accept this and adapt the plan. Try this: If you are going through a particularly stressful period at work or home you might need to reduce the loading of your training plan. Chronic stress will likely have a big impact on your ability to recover, and extra rest day, or a lighter week might make all the difference! Downtime: The ability to relax mentally as well as physically should play a big part in all of our recovery plans, but most of us neglect the mind totally! Try this: In those key weeks of training ensure you have time set aside to relax with family and friends – perhaps some with no involvement in running at all! If you want to go a step further regular meditation practice has been shown to significantly improve your recovery and performance at times of high stress. OOFOS have been so kind and also offered a pair of their London Limited Edition OOFOS for one lucky winner! If you would like to enter, please follow the instructions in the Rafflecopter widget below.